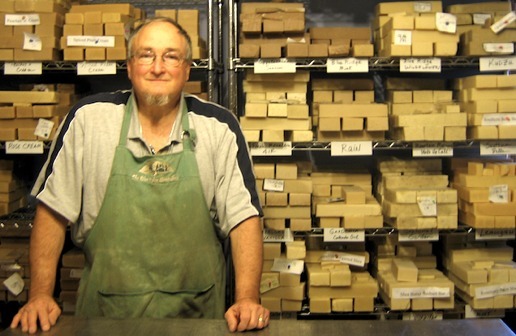 Welcome to The Blue Ridge Soap Shed, where you can select from 150 handmade soap varieties, custom cut and wrapped in five different sizes. Our website is open year round, 24/7, for you to order anytime. Our seasonal retail shop in Spruce Pine opens May 1st and will resume our regular hours 10-5, Monday through Saturday. If visiting before then, please call and set an appointment with us via phone at (828) 765-6001, sending an email via our Contact Us Page (button link located on the top right of this page), or sending us a message on Facebook. We make our handmade soap completely from scratch, combining raw ingredients like tropical oils, goat milk, herbs and exotic vegetable butters in our own original recipes. Each batch is handmade and handpoured, with each resulting block cut into logs, then bars and packaged by hand. The small differences from batch to batch and bar to bar celebrate the handmade charm of our craft. We hope you will be able to visit with us during a stay in our beautiful Blue Ridge mountains. But if you can't, we hope you'll enjoy visiting our web store here where our soaps can be conveniently ordered year round. We specialize in creating unusual soaps for hard-to-treat skin conditions like diabetic feet, eczema & psoriasis, even soap to help combat the skin consequences of chemotherapy and blood thinning medications. Our unscented products are perfect for persons with fragrance allergies or those who simply like it plain and simple. Whether you're looking for soap to discourage Summer bugs; soothe sunburn or poison ivy; remove garlic, onion or fish odors from a cook's hands or gently cleanse a newborn baby's tender skin - you'll find it here at The Soap Shed. We created some of our handmade soaps as aromatic reminders of the beautiful mountains of the Blue Ridge and Southern USA, and they make wonderful souvenirs. Take home some Blue Ridge Wildflowers, Fresh Mountain Air or Carolina Kudzu for yourself or to share with your family and friends. Brief handmade soap making demonstrations are provided during warm weather months and visitors are welcome to view whatever aspect of the handmade soap making operation is being conducted at the time of their visit, including soapmaking, cutting or packaging. One day and multiple day soap making workshops on cold process soapmaking, goat milk soap making, large batch, recipe formulation, and soap business topics in our onsite classroom.